The Goshen College Piano Workshop and Academy is currently on hiatus as of 2016, with no new workshops planned in the near future. This page will be left as a historical record of past workshops and clinicians. 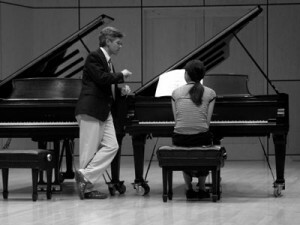 The Goshen College Piano Workshop and Academy comprises lectures, master classes and recital performances presented by distinguished clinicians, composers and performers. Teachers participating in the Workshop hear inspiring lectures relevant to piano pedagogy, performance and literature. Students enrolled in the Academy participate in small group lessons with our artist faculty, practice time and other sessions concerning a variety of topics geared toward the development of student pianists. Teachers and students meet together for student recitals, master classes and evening concerts. This intensive four-day musical extravaganza concludes with a concert devoted to newly learned piano duets and two piano pieces presented by the Academy pianists. For over 30 years the Piano Workshop and Academy has stimulated and informed both teachers and students. Teachers, even those who return every year, comment on their renewed sense of energy, enthusiasm and interest and students always enjoy learning in a stimulating and supportive environment. As an outreach of the piano area of the Goshen College Department of Music, we strive to promote the continued professional advancement of teachers while instilling the highest artistic standards for the next generation of pianists.